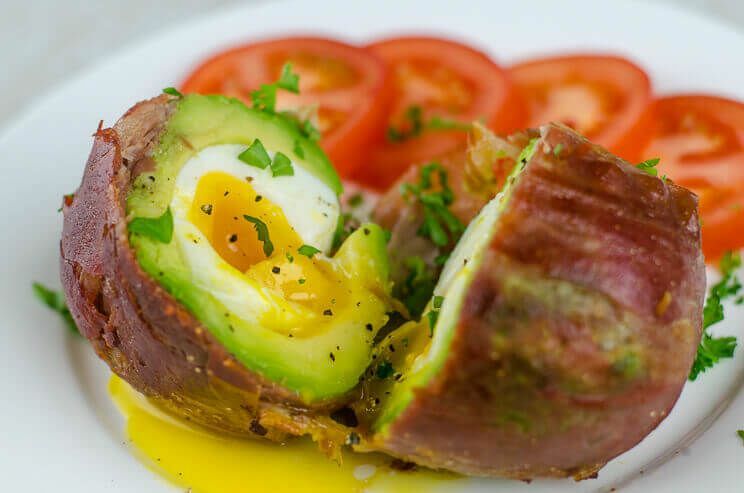 When I first saw this video for a bacon wrapped avocado egg, I thought it was weird. But the more I think about it, the more I realize it could be a great Paleo breakfast. And since tomato season is coming up, it would be a nice low carb lunch with slices of tomatoes. I’m always telling you to use avocados. They’re a healthy fat and can be used in place of mayonnaise. Some people think they don’t like them. (OK, they probably really don’t. I still have some egg issues and probably couldn’t make this for myself since I don’t like runny eggs). A lot of the comments felt that the avocado they chose was underripe. I don’t agree. I think it was perfectly on the lighter edge of ripe and would be delicious. Others found that you really needed to dry off the avocado really well to get the egg to sit in properly as well as get the bacon to wrap well. I found PaleoHacks had their own version that seems to come out better than the Thrillist one. They used prosciutto so perhaps that cooked faster and more evenly than two rows of bacon.